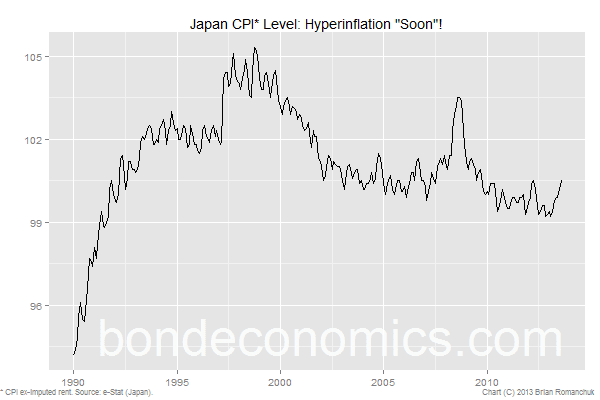 Bond Economics: Fujimaki: Japanese Hyperinflation By 2015! Fujimaki: Japanese Hyperinflation By 2015! 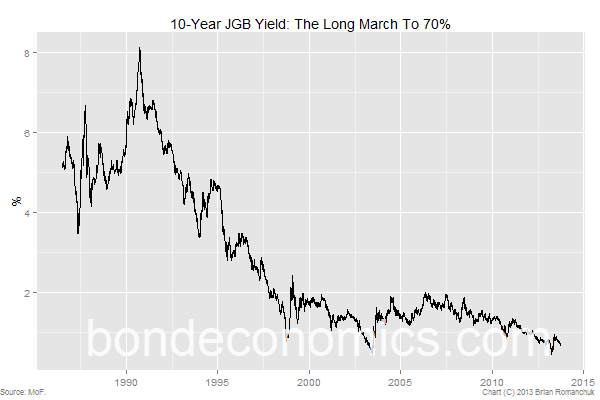 One of the public services now provided here at bondeconomics.com is the tracking of outlandish forecasts about Japan and/or the JGB market. The first entry is provided by Takeshi Fujimaki, an ex-advisor of George Soros and now a member of the Japanese upper house of parliament. I have enjoyed reading crackpot theories about the collapse of the JGB market since I started covering it around 2001, and this entry by Fujimaki looks like it represents the state of the art in this highly competitive field. “Because the BOJ is buying huge amounts of JGBs, market principles in this country do not work.” The balance sheet of central banks throughout the developed world consist mainly of government bonds, and it has been this way for decades. The most successful means of determining bond yields consists of guessing what policy rate government bureaucrats will set. In other words, even slight familiarity with how government bond markets work will tell you that government bond yields are not really set by “market principles”. However, this statement will make him popular with all the gold bugs. Yields on 10-year Japanese government bonds may jump to 70 percent based on what happened in Russia when it defaulted in 1998, Fujimaki said. Sure, what happened to Russia is a great benchmark for a country with $1,135 billion in U.S. Treasury holdings (TIC data; July 2013) and no foreign currency debt. “If the yen goes up to 120 per dollar, Mr. Abe doesn’t need a third arrow,” according to Fujimaki, who expects the currency to drop to as low as 1,000 when Japan faces hyper-inflation in the next two years. Hyperinflation by 2015! Looks like liftoff is starting right now! Really going for the gold bug crowd. This is actually a very impressive stratagem. Even though his 70% yield forecast has a 0% chance of occurring, there is a chance there could be a “renormalisation” of rates within 7 years; why not? And if the 10-year does rise to something like 4% by 2020, he will be able to say “I told you so”. What sets this apart, in my mind, is what he did not say. He avoids setting a near-term target for JGB market collapse (like “a few months”). Only people with too much spare time on their hands will remember a blown forecast on a two-year horizon. Of course, his worries (debt default and hyperinflation) are incompatible. In a hyperinflation, the monthly inflation rate is 50% or higher; so even an inflation-linked bond with a standard monthly computation period of one month will lose at least 50% of its purchasing power due to the indexation lag. If the yen collapses, the Japanese government need only sell a tiny sliver of its Treasury debt to buy back most of its debt. But why quibble, since there’s no chance of it happening anyway? Lawmaker wants to raise corporate profit share of GDP at the expense of households. This is to be done by hiking the consumption tax rate, and cutting the corporate tax rate. Funnily enough, polls say such a policy is unpopular with the voters. So he makes up risks to the government bond market. He then states that the rise in the consumption tax miraculously cures those risks. Simon Wren-Lewis wrote an article on how austerity is being used as cover for political objectives about a week ago, explaining why this rhetorical strategy should not come as a surprise. But to end off on a more serious note: this is part of a push to raise the Japanese consumption tax, which appears likely to occur. The theory is that the planned fiscal policy shifts are supposed to be neutral for growth, as there will be offsetting stimulus undertaken. I do not have a fancy model of the impact of their proposed fiscal changes, but it seems that they are effectively replacing “high multiplier” spending by “low multiplier” spending. In order for the impact to be neutral on growth, the fiscal deficit would have to be larger. Additionally, I am skeptical that businesses will take up investment incentives in the current sluggish growth environment – especially if domestic consumption falls due to the tax hike. And so, it appears highly possible that Japanese policymakers will drive their economy into recession yet again due to a foolish focus on fiscal ratios. Hello again Brian. I finally responded to your comment on my simulation. Thanks. I've read some of your articles. I have not yet had time to write about inflation, never mind hyperinflation. I see hyperinflation linked to the existence of foreign currency "liabilities" (not just formal debt), but these do not really matter for the major economies. I know you reject that explanation for hyperinflation, but I did not see why. I will eventually get around to the topic of inflation once I can get my hands on more data. I can imagine a plausible scenario for high Japanese inflation ("core" eventually reaching 5-10%; hey why not? ), but this would take years to develop. Japan is vulnerable in that they have to import a lot of raw materials. And they would have to do things that they are currently not doing to get there. I am like other MMT writers who reject the quantity theory of money. I take this view based on long empirical studies of monetary data and inflation in the major economies (it was part of my job description), and not based on theory (the only theory I was really familiar with at the time was actually Monetarism). I do not see QE doing anything; it didn't work in the past either (see chart above). Sure, Japanese inflation rates have risen over the past couple months. If you look at my chart, we have seen similar things countless times over the past two decades; but Japan has still achieved price level stability. I would be impressed if the CPI manages to rise above the top end of the y-axis of my chart above, never mind having a hyperinflation. It is ok to reject the quantity theory of money but you are wrong if you reject the eqation of echange. Do you? I am unsure what equation you are referring to. Is is MV=PQ (or whatever)? Yes, that equation. The quantity theory of money is that equation with the added assumption that the velocity of money is constant over a long enough period (which rational minds can argue). But I think all real economists agree that this equation is true (though some don't agree that it is useful). I don't think there's any reasonable argument against the equation, it is essentially a rewriting the definition of velocity. V = PQ/M, or V=GDP/M (where GDP is nominal GDP). V is obviously not constant; this is readily verified by looking at recent time series. Velocity is the defined by the inverse of the ratio of money (a stock variable) to nominal GDP. If you look at stock-flow consistent models, in a steady state, pretty well any stock variable will drift towards a steady ratio to GDP. Correspondingly, reasonable mathematical models of economies will have velocity tend towards a constant. But the same is true for any stock variable. So money is not particularly special in this regard. I am in the camp that this is just a curiousity, and changes in base money have no major effect on the economy, as long as the central bank supplies the minimum amount needed to for bank reserves. The demand for notes and coins is roughly related to nominal GDP, but the central bank has essentially no control of the amount of paper money in the economy.